Recently, (25th Feb 2014), Microsoft released the first Service Pack for Office 2013. If you have configured Windows Update to include Office, the update should be automatically available to you. Here are some more details about it. The Office Sustained Engineering Blog announced the release of Service Pack 1. Please note that this includes many different products including Office, Project, Visio, SharePoint , Exchange and Language Packs. 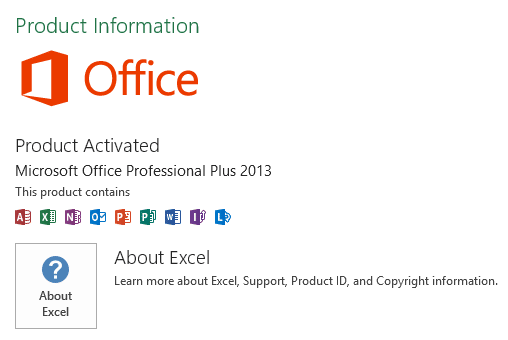 Open any Office 2103 product (Excel, for example) . Open File menu and choose Accounts. (For Outlook it is called Office Accounts). Click on the About Excel button. Check the version number. If the number is lower, Service Pack has not been applied. It should happen automatically. Check recently installed updates under Control Panel – Windows Update. Check For updates… you should see SP1. Surprisingly, the size of the update seems to be ONE GB when I updated my laptop. But when I tried the same thing on Surface Pro, the size was 850 MB… don’t know why. There are few new things documented but most of them are esoteric and of no significant general benefit. But I am sure there is more because I was involved in the beta testing of the SP1. If and when I find the list of improvements, I will post it in this blog. If you use the Office 365, Click-to-run installation, you will automatically receive an update very soon.